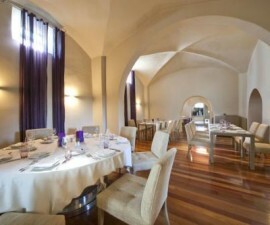 The BL Lounge Restaurant in Évora is something of a departure for Évora eateries. 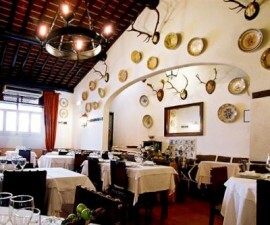 Located right in the heart of the historic Old Town, next to the famous temple of Diana in Rua das Alcaçarias, this excellent restaurant offers modern fusion cuisine in a contemporary and well-designed dining room. The traditional architectural exterior gives no clue as to the sophisticated and airy dining room that is hidden behind its walls. So many of the restaurants in Évora are in Portugal’s Old World style and whilst that is somehow fitting of the city’s ancient setting, it is also refreshing to find something that bucks the trend. 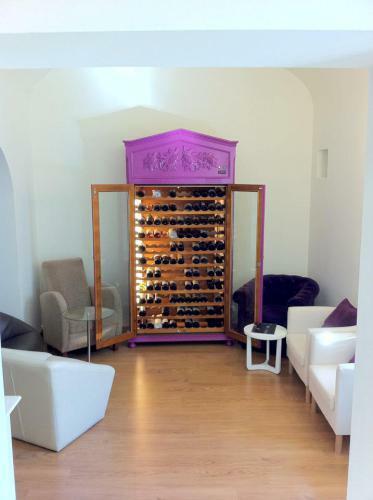 The BL Lounge Restaurant is set in a large dining room, tastefully decorated in whites with flourishes of purple and silver and with its well-stocked wine cellar prominently on show down the length of one of the side walls. The tables are spacious and the chairs comfortable. The modern fusion cuisine also makes a pleasant change from the traditional flavours of Portugal’s Alentejo region, which feature heavily on most of the menus in town. BL Lounge Restaurant draws on influences from all over Portugal and further afield to add a unique twist to its gastronomic offerings and its efforts have been rewarded recently with its first ever listing in the famed Michelin Guide, the ‘bible’ of worldwide cuisine. Antonio, the owner, ensures his team offer a warm welcome and that guests are well looked after during their meal. 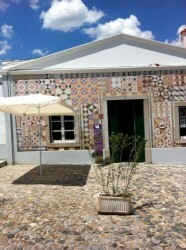 He is very knowledgeable about the local Alentejo wines and happy to suggest the best bottle to suit your meal. Menu highlights include beautifully tender octopus or oven-baked cheese with oregano and raspberry jelly for starters, whilst tasty mains include risotto with asparagus and shrimp or roast beef in red wine with tomato migas. There is plenty to choose from on the dessert trolley and don’t be surprised if Antonio throws in a complimentary glass of his famous grappa or house distilled brandy. There is a separate lounge area, which is the perfect place to retreat for a coffee or liqueur after your meal and is a popular bar area in its own right amongst Évora’s residents and many visitors.